Recently at Kroger, we ran across some phenomenal deals! The trick was figuring out how to use or store them so they don’t go bad. Fresh mozzarella – $1.99/8 oz. Plain nonfat yogurt – $1.49/32 oz. Unsweetened almond milk – $2.50/half gal. Organic grape tomatoes – $2.50/10 oz. The most exciting finds were the organic liquid whole eggs and the plain yogurt. I bought everything the store had, and as you can see from the video, it’s a lot. How will we eat these before they go bad? When we come across deals like this, we try to weigh the savings against the potential food waste. We don’t waste food in our house. Everything we buy is either something we will for sure eat or something we can freeze and eat later. So the liquid eggs will go in the freezer until I’m ready to use them. This change their texture slightly, but I can bake with them, and there’s a chance I won’t mind the texture in something like a veggie-loaded frittata. Honestly, we will probably eat all of the yogurt. My kids love it, we don’t eat it that often, and I made a batch of simple One-Bowl Granola for breakfasts this week. If we can’t finish it all quickly, I will freeze the rest. Typically, we use yogurt in smoothies, so it won’t be a problem when freezing and thawing changes the texture. We are trying to stick to our current grocery budget (about $1.20 per person, per meal) while following some pretty enthusiastic (maybe overzealous?) health and wellness goals at the same time. This grocery haul will help a lot! If you like these grocery haul posts, let us know! Leave a comment, share it on Facebook, like and subscribe to the YouTube channel, and follow us on Instagram for more! 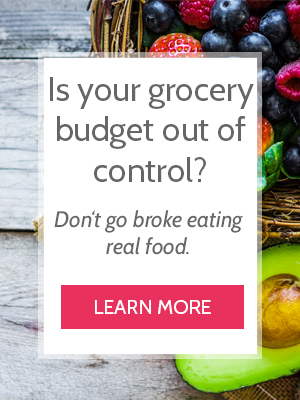 If you need some budget-saving, healthy-eating inspiration, we share simple, frugal, real food menu plans every month for FREE in the Cheapskate Cooks’ 1-Min Email. Get the next one here.